I was kinda surprised that I didn't get into the Local Celebrity category, but after looking at the finalists, yeah I understand. 我还不够红嘛~~~~慢慢来 ok? I need more time for people to know who I am. And for now, I'm already contented to be a selected finalist in this competition. After all, I only really began blogging last October. 7 months only leh~ Some of the bloggers have been blogging for what, years? So THANK YOU!!!!! 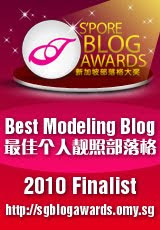 Okay, enough of this..go to the link below, click on Best Modelling Blog category, and VOTE FOR ME NOW~~~!!! !